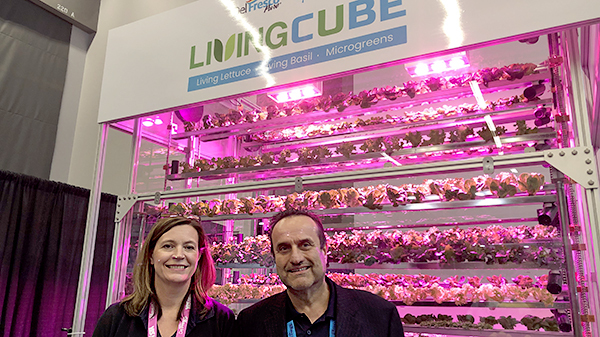 Jo-Ann Ostermann, of CubicFarm and Carl Mastronardi of DelFresco Produce demonstrated the vertical farming system by CubicFarm at CPMA in Montreal. MONTRÉAL—Vertical farms are all over the news as players want to cash in on consumer demand for local fresh produce, but it’s not as easy as dropping a container next to a supermarket. That’s where a background in greenhouse growing comes in. Kingsville, ON-based DelFresco Produce Ltd. is working with CubicFarm Systems, Milner, BC, to expand the company’s product line and footprint with container farms. Mastronardi envisions nationwide expansion over the next five years and is drawing on decades of experience growing greenhouse produce in Canada. Growing in containers is a hot trend right now, but not everyone’s up for the challenge. “A lot of people are getting into it, and a lot are failing,” he said. Part of that is the technology, and part is the high cost of labor – two things for which CubicFarm and DelFresco believe they have the solution. CubicFarms’ system is fully automated, instead of relying on racks that have to be manually rotated. That cuts down tremendously on labor, Mastronardi said. The technology has evolved over the past decade and a half. Most growers wouldn’t consider lights for vegetables because the energy cost is too high. Nowadays, the LED lights are highly specific, emitting only the light necessary for optimal plant growth, with new tech constantly coming online, said Jo-Ann Ostermann, vice president of CubicFarm. “We’re getting better and better at it every day,” she said. Mastronardi is no stranger to taking risks with a new technology. DelFresco launched greenhouse strawberries in Ontario several years ago, and Mastronardi was recognized by the Ontario Produce Marketing Association as its Produce Person of the Year for the endeavor in 2018. With this new venture, DelFresco is aimed at flavor and safety. “What we’re trying to do is give the consumer a real safe product, and a taste experience,” he said. Products planned for launch include living garden lettuces, which consumers can buy with roots intact and continue growing at home, as well as living microgreens that stay fresher longer. “The biggest advantage is a better flavor profile whether it’s 120 degrees outside or 20 degrees outside,” Mastronardi said.